Democratic presidential candidate Hillary Clinton called for the federal government to encourage more companies to offer profit-sharing plans to their rank-and-file. American workers are struggling and American corporations are posting record profits. Hillary Clinton thinks the government could help workers get more of a leg up. In a speech Monday she said she'd like the federal government to "encourage" companies to offer profit-sharing plans to employees. "Hard-working Americans deserve to benefit from the record corporate earnings they helped produce. ... Studies show profit-sharing that gives everyone a stake in a company's success can boost productivity and put money directly into employees' pockets. It's a win-win," Clinton said. She didn't give details -- she promised those later this week. But it's a fair bet she might draw on some ideas put forth by influential Democratic thinkers. Whenever someone calls on the federal government to "encourage" the private sector to do anything, it's often code for tax breaks. That's because beyond the federal minimum wage, the government really can't tell companies how much to pay workers. 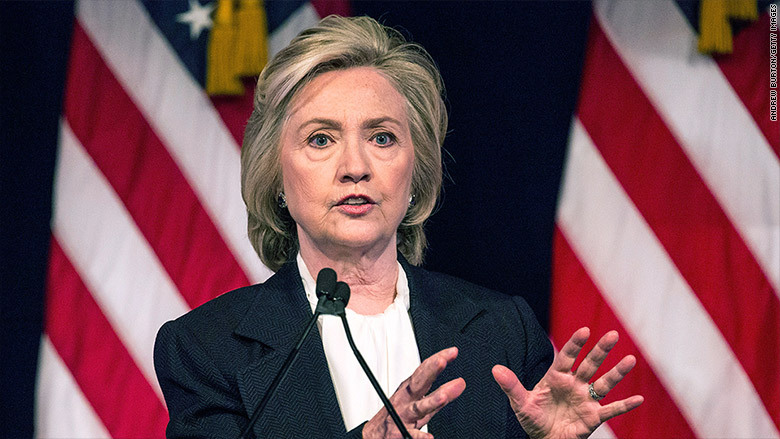 Clinton's campaign confirmed her proposal would focus on tax changes. Breaks for companies that share profits with its employees is a recommendation from the Center for American Progress, a Democratic think tank where a few of Clinton's policy advisers once worked and whose president was a campaign aide in 2008. The tax breaks could be available if, say, the company contributes as much to the bottom 80% of employees as to the top 5%. A profit-sharing plan is one in which only the employer makes contributions. Those contributions will vary, depending on the company's profitability in a given year and may be tied to a formula based on a worker's salary. The money typically grows tax-deferred, as in a 401(k). And you may need to work at the company a certain number of years before you're entitled to 100% of the company's contributions. The Center for American Progress also recommended expanding tax breaks to companies that create employee stock-ownership plans (ESOP), in which an employer typically contributes company stock to an employee's account, essentially giving workers an ownership stake in the enterprise. Chris Van Hollen, the top Democrat on the House Budget Committee, meanwhile, has proposed restricting tax deductions that corporations may take on executive compensation over $1 million but would allow a break if they provide their employees with ownership and profit-sharing plans that meet a given standard. Under current law, publicly traded companies may not deduct more than $1 million in executive compensation unless it is performance-based - like a bonus for exceeding a given goal, said Steve Rosenthal, a senior fellow at the Tax Policy Center.